Oh dear, December is here! December is a special month because it is hubby's birthday. It also means we will be closing in on the new year, which means our wedding anniversary is also near. We are almost 2 years young, insyaAllah. Anyway I am still very much a contest junkie. However i haven't been joining, let alone winning stuffs lately, which is a bummer. I am an avid RHBonline user and they are currently having a contest called Italia Mania. The weekly prizes are 5 x RM100, the monthly prize is 3 x Trip to Italy for 2 and the grand prize are 5 x Vespa GTS300. The contest period is from 16 October 2012-31 December 2012. I honestly think the monthly prize is way better than the grand prize, don't you agree? I am so pissed off with RHB at the moment because I can't enter the contest. For whatever reason, the reference number I entered is not valid. I called for assistance and they too seem a bit oblivious with the t&c and they weren't able to solve my problems. They asked me to try again tomorrow. GRRRRR. This reduces my chance at winning. Sigh. Speaking of winning, I recently won a bottle of SKII Miracle Water from Bella NTV7. Isn't that awesome? I was required to collect the prize at Media Prima but I got my lil bro to collect it for me. I can't wait to try the miracle water and see if it truly is a miracle. My skin now is OK, not flawless definitely but OK. It does get oily towards the end of the day and I do get the monthly zit before or during that time of the month but other than that, alhamdulillah my skin is OK. I only use Olay's facial wash and Olay Total Effects. I don't use a toner, I don't use a nightcream, I don't use any serum, I don't use any whitening products so I hope this miracle water will help enhance and boost my skin's condition. 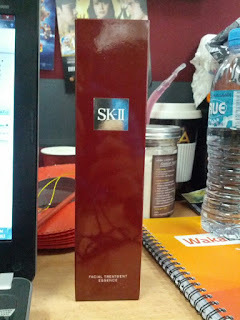 And I hope my skin won't be too pampered with it so much so that it will no longer accept Olay. But then if it really does wonders, I might consider using it in the long run. The Miracle Water. P/s: This is not my desk. This is lil bro's desk. He sent me this pic after he collected the prize.